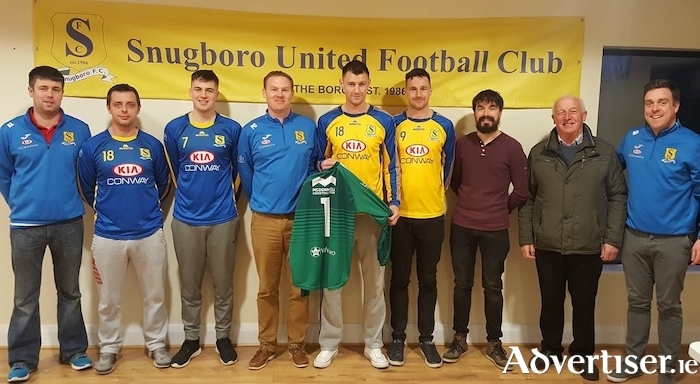 Conway Motors, Castlebar, presenting two new sets of jerseys to Snugboro United. Straide and Foxford United moved to the top of the Elverys Sports Super League on goal difference thanks to a big 5-0 win at home over Ballyheane last Sunday. The Green Road men went in leading 2-0 at the break, thanks to goals from Daniel Gorman and John Durkan; they added three more in the second 45 minutes with Johnnie Cocozza, Ashley Atkinson, and Stephen Moyles all finding the target. On Saturday night S&F will be in Westaro Cup action when they host a bottom of the table Iorras Aontaithe who were beaten 4-1 by Manulla last Sunday at home in Carne Nash. Manulla led 2-1 at the break thanks to goals from Lucas DePaula and Frany DeSilva, with Nathan Reilly getting one back in between those strikes for the home side. Chris Maughan and Declan Tonra added on goals in the second half to seal the win for the visitors. That was Manulla's first win of the season and this weekend they will be hosting league champions Westport United on Saturday evening in the Westaro Cup. United picked up their third league win of the season last weekend with a 2-0 win on the road to Kiltimagh/Knock United in CMS Park. Mark McDonagh struck to give Westport the half time lead and they made the points safe when Darren Browne struck eight minutes into the second half. Kiltimagh/Knock United will host Castlebar Celtic in the Westaro Cup this weekend, the Hoops will head to east Mayo after losing out to Sligo/Leitrim side Carbury at the semifinal stage of the Connacht Junior Cup. Last weekend's other Super League game saw Ballina Town pick up their second league win of the season with a 5-2 win at home against Claremorris. The south Mayo men went into a 2-0 lead early on through an own goal and a Finian Brady effort. But Ballina reeled them back in with Brendan Lavelle striking twice before Dwayne Helly made it 3-2, Lavelle then added two more before the end to make sure of the points. The north Mayo men will be travelling to Quigley Park this weekend to take on Ballyheane in the league cup. In the Premier Division Ballyhaunis Town continued their good start to the season making it three from three with a 5-1 win over Achill Rovers, with Gary Higgins bagging a hat-trick and Sam Olabude and Hamad Althobhaney bagging one each as their side moved to 17 goals scored for the season. Glenhest Rovers moved into second place with a 2-1 win over Snugboro United, Sean Curry put the Boro in front early on from the penalty spot, David Walsh levelled it up midway through the second half and Chris Rowland hit the all important third goal in the game to pick up the points for his side. The other games in that division last weekend saw Conn Rangers pick up the points after a 1-0 win over Ballyglass B, thanks to Eoin Prendergast's strike, and fellow north Mayo men Bangor Hibs run out 2-0 winners over Westport United B. The game between Swinford and Fahy Rovers was postponed due to Swinford's Connacht Shield semifinal against Colemanstown United, which they won 3-1 after extra time with Joe Slevin, Paddy O'Donnell, and Peter McNicholas scoring the goals to send them into the final against Kilkerrin United. Saturday, April 14 at 6pm: Manulla v Westport United, Straide and Foxford United v Iorras Aontaithe. Westport United will host a girls first invitational tournament for u10, u12 and u14s on Saturday, April 21 at United Park in Westport. This tournament which is being held in association with Portwest, will bring the best of girls football from all over Connacht for a festival of football. For more information email: [email protected].